Another interesting CULP report from Cadet Broderick who spent part of his Summer in Gabon. This summer I had the opportunity to travel to Libreville, Gabon to conduct training with the Gabonese military. I was able to obtain this opportunity by applying for a spot in the Cultural Understanding and Language Proficiency (CULP) program. Fortunately, I was picked to conduct my mission of teaching English and become more culturally diverse. Every weekday there were nine cadets conducting English classes for around 30 Gabonese military members from 0830 to 1130. We were assisted by a member of the Defense Language Institute (DLI) in how to go about instructing our lessons. Along with these regularly scheduled instructions there were times that the cadets were able to visit different schools with ages ranging from 4-24 years old collectively. Typically, the ages were on the younger side but a couple of the schools also had students that were older. The main purpose of visiting these schools was to give basic English instruction and experience the culture of the country, but a very important part of interacting with the students was to give them hope. Other activities that were conducted after our morning English lessons, besides the school visitations, were going to the American embassy and making presentations at a Department of State affiliated location called the American Corner. The American Corner was a place where people would go that were looking to come to the United States or wanting to know more about it and learn English. Cadets prepared two presentations each, one on their university and another on a US based interest item. After presenting information on our universities it was made apparent that the Gabonese only wanted to know about how to get to the United States. A smaller group of cadets was put together to compile this information and brief it to the Gabonese who were present at the American Corner. 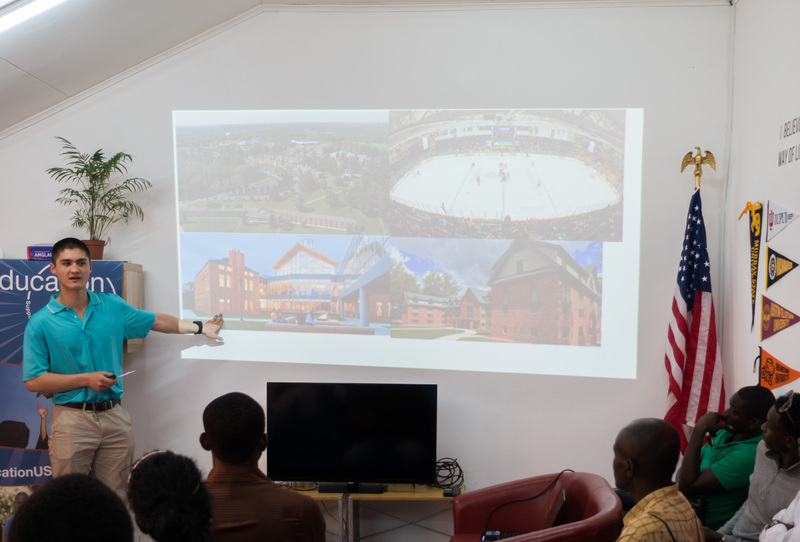 Information on visas, exams, different universities, and the process itself was given to the Gabonese in the hopes of them taking the initiative to try their hardest and come to the US. There were also two Saturdays at the American Corner where the cadets interacted with children and a member of the Department of State in order to teach English. At the embassy, the cadets learned about the Department of State. Presentations were given by the Regional Security Officer, Defense Attaché, a nurse, a member of the Marine Security Guard, the Deputy Chief of Mission, and the Ambassador. These people gave us a wealth of knowledge and a great amount of insight into their world. We also ran a 5K with employees from the embassy for a fundraiser. The cadets were also invited to a lunch with members of the Young African Leaders Initiative from Gabon at the ambassador’s residence by the ambassador herself. There was also a barbecue that we attended held by employees from the embassy. Another very enlightening experience was being able to visit part of Central Accord 16 and meet other members of the United States Army that were in Gabon at the same time we were. BG Moore, Deputy Commanding General United States Army Africa/ Army, was able to sit down with us for about an hour at breakfast one morning and talk to us about his career and answer any questions we had. LTC LaMotte, 703rd Brigade Support Battalion, 2nd Infantry Brigade Combat Team, 3rd Infantry Division, was able to show us around the Cooperative Security Location (CSL) in Libreville. At this location we were able to meet many different people and see exactly how a joint operation like this functions as well as talk to many 2LT’s about their careers so far and ask for any advice they may have for us. Traveling to Gabon to teach the military English, as well as being fully immersed in the culture of the country, was a very enlightening experience. Starting out there were some assumptions made but these were easily cleared up once in country. Getting to see the similarities and differences in the ways of life of the people of Gabon and comparing them to those of the United States provided for development which better prepared individuals to be suited in handling situations where a difference in culture can easily affect an outcome. There are a few major topics that differ between the United States and Gabon. Two of these are the concepts of time and relationships. The Gabonese do not feel any obligation to being prompt and punctual. An appointment can be made but not actually taken care until several hours later. The pace of life in Gabon is much slower as the Gabonese are looking to build relationships with others whenever they can. Laziness is another big factor that contributes to the effectiveness of the Gabonese. Many do not want to take the initiative but want the results that would come with the initiative. The most interesting part of this laziness is that many Gabonese recognize the laziness in themselves and others. This is why places with little European influence run much slower, while places that have been influenced by Europe have somewhat of a faster pace. Exchanges of money are not seen as an item for money but rather as something being given and in return receiving help in the form of money. Bartering is an example of how this applies as no set standard is made because this provides a means for building up a relationship. Another peculiar aspect of the culture of Gabon is their opinion of other Africans and the French. They tend to dislike people from other African countries besides Gabon and like the French, trying to be increasingly French. Many citizens of Gabon are getting away from their roots and forgetting their mother tongues since they are learning languages like English and French. A large amount of people would like to come to the Unites States and study as well as improve their English. Overall the people of Gabon are not that different from the population of the United States. The window to apply for next year’s CULP missions has just opened up and I am hoping we will have plenty more adventures to share next Summer. Still waiting on a few more reports from this past Summer.